Stiff and aching from being curled up next to the emergency rudder in the bow, I stumbled to my feet and steadied myself on the forward stack to stretch out straight. That’s weird, when did we stack the sleeping bags up forward? It begins to move... “Whoops sorry Lucas, go back to sleep.” He had managed to position himself on top of the stack right up against the forward bulkhead. Sleep is a very valuable thing when you’re racing off shore and after being moved backwards and forwards from my bunk to the bow a few times I felt terrible when I woke Lucas up half way through his off watch. Sorry mate. When you think about a transatlantic leg you don’t really expect to find yourself sleeping up in the bow and considering this was a leg where records in the Volvo had been broken it was a strange thing to wrap your head around especially as 24hours ago I was facing a full fire hose in the face. The fog leaving Newport was like déjà vu. Like sailing a ghost ship as the other boats disappeared into the fog. We were hard pushed to keep up after our in port section where we were faced with a penalty turn at the first mark. Straight into a wall of fog we disappeared quickly and said good-bye to Newport. We tried to hang on to the rest of the fleet and head south but we fell off the pressure system and had no choice but to head north. As the position reports came through we realized we were on our own and I must admit it was frustrating hearing the speeds they were doing as they continued south and we pushed North. Then the position report came that “the red boats” had also come north too but our speeds compared to the southern fleet were not comparable. We were pushing in the conditions we had as we fought to get in the currents of the Gulf Stream. The next watch Annalise was over the moon with excitement and woke Elo and myself with the fantastic news that during the last 6 hours we had managed to overtake Mapfre and was right alongside Dongfeng. Whilst you were all watching it live as we sailed across the top we had no idea. But now the fight was on to stay with them and battle through the light breeze. Eventually we managed to got through the lighter breeze and now the entire fleet was headed in the same direction. The breeze picked up to 30+knots and despite the sea temp being 1.5degrees it was flat water so the fire hose wasn’t on full blast and it was perfect sailing conditions. With perfect sailing conditions the most alarming discovery whilst we sailed in the Gulf Stream was that in two watches we saw more plastic in the ocean than we had on the previous two legs. Helium balloons, plastic bottles, milk cartons etc., a relatively big wake up call. As we pushed onto Cardiff and got closer to land our Welshmen’s smile began to grow. There is nothing greater than sailing into your homeport. Bleddyn took the wheel and had the welsh flag flying high off his shoulders with pride as we approached the finish line. Despite our positioning the fleet we’re still smiling and a happy crew. We’ve grown a lot and created friendships and a family. 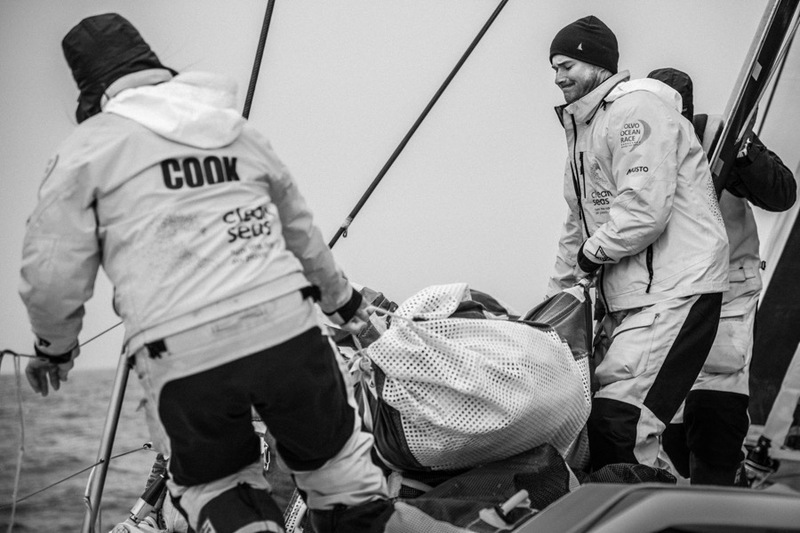 Onwards to the next leg into Gothenburg where our Swedish sailor is hoping for a podium finish. Let’s see if we can get it for him only two more legs to go.